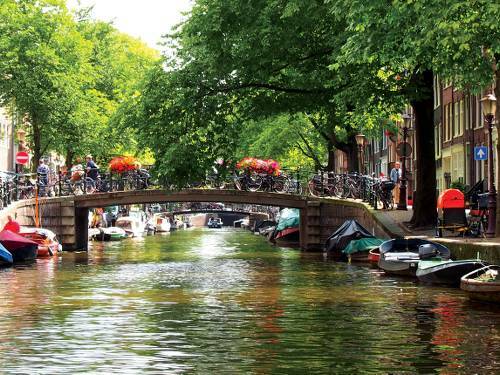 With its scenic countryside, relaxed villages and handsome cities, Holland offers travelers a fabulous contrast between traditional and modern, rustic and stylish. 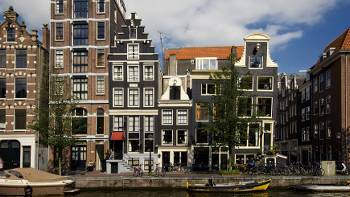 Wander the pretty streets of Amsterdam, an exciting but laid-back city of canals, cobblestones and culture, with stunning architecture and some of Europe’s best galleries and museums. 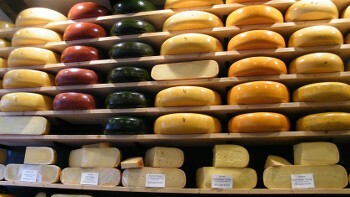 Visit the famous cheese making town of Gouda; admire the historic architecture and charming shopping streets of Haarlem; and cycle through blooming bulb fields en route to the charming small city of Leiden, birthplace of Rembrandt. 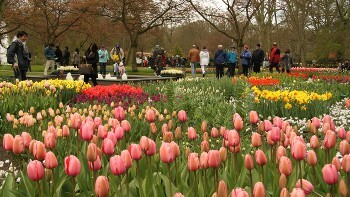 Head to the Keukenhof Flower Park to see thousands of tulips, daffodils and hyacinths in Europe's most elaborate floral display; and visit the historic Kinderdijk windmills, a quintessential Dutch icon and World Heritage site, to see 19 beautifully-preserved medieval windmills and learn about their ingenious design. 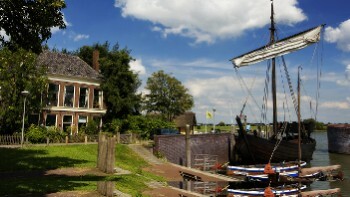 Cycle through quaint fishing villages and lively harbour towns with rich sailing traditions as you explore the picturesque country surrounding Ijssel Lake; explore castles and canals on an exciting family adventure; or see the highlights of Holland and Belgium on our outstanding Amsterdam to Bruges or Brussels to Amsterdam Bike & Barge adventures. With its flat terrain, picturesque countryside and world-class cycling infrastructure, you’ll definitely want to follow the locals’ lead and experience Holland at handlebar level. 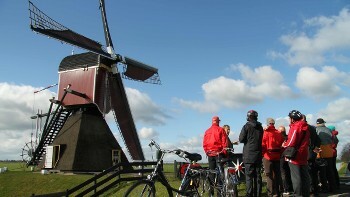 Take a look at our unique range of cycling itineraries and start planning your Dutch adventure! The canal city has a rich artistic heritage and some of the best museums and galleries in Europe. The quintessential Dutch icon showcases 19 authentic windmills and their trademark water management ingenuity. Visit Europe's most elaborate display of flowers featuring tulips, daffodils and hyacinths of various colours, shapes and scents. Explore lively harbour towns with rich sailing traditions. Trips only include what you need like accommodation, meals, bikes on cycle trips, luggage transfers, maps and route directions on self guided trips and an experienced local guide for group trips, as well as the peace of mind that comes with complete backup and support. On self guided trips you can expect to receive up-to-date and well researched route notes and maps, seamless luggage transfers and competitive pricing on all essential services. Many self guided trips also have daily departure dates, allowing you to enjoy the convenience and flexibility a self guided trip offers. Cycling or walking, 2 star or 4 star, small groups or self guided, land or sea - we can help you explore Europe exactly the way you want. Our Waste Management Policy encourages our travellers to take their own reusable water bottles, coffee cups and reusable stuff sacks to avoid single use plastics. In the mountains of the Pyrenees and Mont Blanc our local partners reduce the amount of packaging taken on tour and ensure all waste is carried out from refuges that do not have road access to help dispose of it properly. In the regions that we travel tourism is the main source of income for many local people. We support them by only working with local family run hotels and suppliers so your money supports the community that hosts you. The paddock to plate across Europe is one we encourage by choosing to work with accommodations that source produce from local farms. This provides you with fresher meals and ensures your money directly assists local economies. Often family run, these charming hotels range from 2 to 4 stars and provide access to local living thanks to your hosts. The hospitality is generous and their local knowledge is invaluable. Where possible, we choose locations that add to your experience. Think of it as your floating hotel, where each day you experience a different sunrise and sunset location and you unpack only once. Berths range from two lower or bunk bed style but can be upgraded to larger berths with double beds. The bar and dining area is always a popular hangout at the end of each day's activity. The crew includes an onboard cook. Electricity in The Netherlands is 230 Volts, at 50 hertz. The most common pin type is C. (2 round prong). Visas not required for citizens of Australia, Canada, USA and New Zealand for up to 90 days in a period of 180 days for all Schengen countries (see https://tinyurl.com/lkho3qg for countries part of the Schengen). Please ensure your passport is stamped on arrival in the Schengen area. For all other nationalities and for longer stays in countries covered by the Schengen Agreement (Australian New Zealand, Canadian and US passport holders), please contact the relevant embassy. Stays of longer than 90 days in the Schengen area require a long stay visa for the country you are spending most time in. However long stay visas are unlikely to be issued unless there is a valid reason (eg. studying in country). Unfortunately we cannot assist in obtaining visas for long stays due to individual country visa requirements.